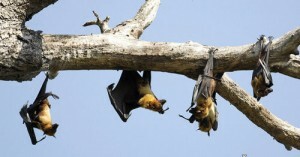 The Indian Flying-fox has more than one meter wide wing span, making it one of the biggest bats in the world. It has earned its name from the fox-like face, markedly the forehead, which looks like taken from a ground mammal. Despite their enormous size, the Indian Flying-foxes are harmless creatures. These bats inhabit India and the surrounding territories from the Maldive Islands in the Indian Ocean to dry land territories in India, Pakistan, Nepal and Sri Lanka. Their natural habitat is rainforests, swamps and other territories near large water sources. They reach up to 30 cm length and a wing width of up to 130 cm, while being almost 2 kilograms heavy. The colouration is usually brown to russet. Indian Flying-foxes are excellent fliers – that’s why they inhabit many islands far away off-shore. There has even been a case when a bat landed on a ship to rest, over 300 km away from the shore. Indian Flying-fox spends the day sleeping in a tree with its head down, having wrapped the wings around its body. They usually choose a “home tree” in which they spend most, if not all, days. 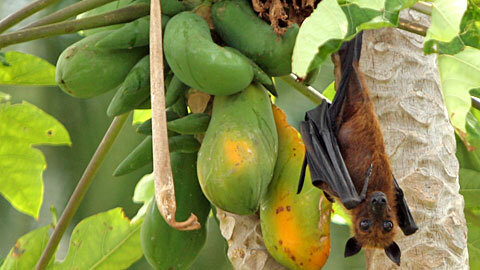 You can tell a Flying-fox’s home tree is nearby by the specific musk scent. These bats live in colonies of up to 1000 individuals that spend all their lives together. In the evening, the bats become increasingly restless and at one point they all take off and find a feeding place, often very far from their resting place. Unlike other bats, the Indian Flying-foxes don’t use echolocation system while flying in the dark – they rely on their vision and sense of smell. 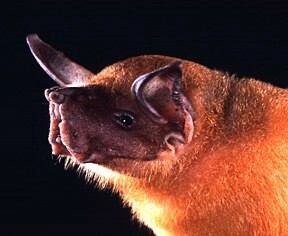 Their eyes are also notably larger than for any other bat species. These bats are not dangerous even a little bit, as they feed solely on fruits – they chew bananas, mangoes, guavas and other fruits. A large Indian Flying-fox colony can cause great damage to vineyards and orchards, as they selectively find and eat all the fruits, berries and other sweet vegetation. The mating period lasts July through October. The bats don’t form pairs and are generally not selective about their mating partner. After successful copulation, a five-month long gestation period begins, which is rather long for such a small mammal. The young bats are born much more developed than any other bats. The young are nursed by their mother and the male shows no interest in raisin them. The young bats cramp into their mother’s fur and go with her to the feeding area already in the first week, and the mother keeps feeding them for about 5 months. When they’re 8 months old, they start feeding on their own and they become sexually mature at the age of 2. Currently, the Indian Flying-fox is not endangered, although many farmers have actually began to wage war against these creatures, in order to protect their farmlands. In some areas, the bats are also used for medical purposes, while in others the meat is considered a delicacy and unfortunately the population of these bats seems to be on a decline.